Five petals and two petals pave set necklace styles, two petal drop earrings with pave set diamonds, large diamond set ring all from white gold Lunaria. 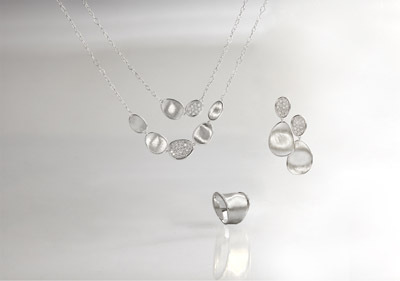 With ‘Alice Through the Looking Glass’ opening this summer, we are inspired by the new 18ct White Gold Diamond Lunaria collection by Marco Bicego. Beautifully hand worked white gold and diamond petals with mirror like qualities and the organic shapes echoing Lewis Carol’s topsy-turvy world. Nature, always the inspirational muse of Marco Bicego, is further refined in the sophisticated new collection – Lunaria Diamonds. Lunaria draws its name from the namesake flower: its exquisite and elegant style, where every little detail holds a secret, is revealed in every irregular, hand-engraved surface of Lunaria. Each piece has an inimitable lightness, exemplifying the extraordinary artisanal knowledge and heritage of the goldsmithing tradition of Vicenza, where every piece of Marco Bicego’s fine jewellery is made.